Mercedes Benz has launched brand new edition of C Class sedan in the Indian market. Though the manufacturer has already made the respective sedan available for sale in the domestic market, it was being imported as Completely Built Units. Mercedes Benz has now succeeded in producing the sedan locally and has launched locally produced sedan with a relatively cheaper price tag. Mr. Eberhard kern, The Managing Director and Chief Executive Officer for Mercedes Benz India has stated in connection with the launch of locally produced C220 “With the local production of the C 220 CDI and in tune with its ‘Make in India’ commitment, Mercedes Benz India has now an increased localization content of 60 % in this car. We are confident that with the production of the new C 220 CDI in India, we will be able to create a higher benchmark in terms of local production of high end luxury cars in India, and make our customers equally delighted by providing an unmatched value. Additionally we have launched the ‘Corporate Star Lease’ product, a dedicated leasing solution from Mercedes Financial Services that will bring immense value for our potential corporate customers”. The manufacturer has not made any changes in the locally produced C220 CDI sedan when compared with the imported edition of the same. The sedan comes powered with the same 2.2 litre four cylinder diesel engine that is capable of churning out 170 bhp power at the peak along with 400 Nm of torque. As per the information, the sedan is capable of sprinting 100 kmph speed from rest within just around 7.4 seconds only and the top speed of the vehicle is around 233 kmph. 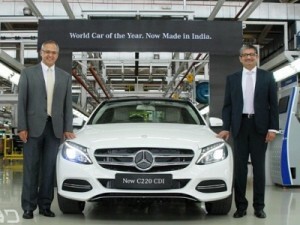 The manufacturer has also claimed that the new C220 CDI sedan is capable of delivering around 19.27 kmpl on an average. Mercedes benz is offering the locally produced ‘C220 CDI Style’ sedan for just Rs. 37.9 lakhs only which is around Rs. 2 lakhs cheaper than the imported edition. This entry was posted in Autos, News on May 14, 2015 by UdutaHK.